Did you ever wonder whether education has a role to play in preparing our societies for an age of artificial intelligence? 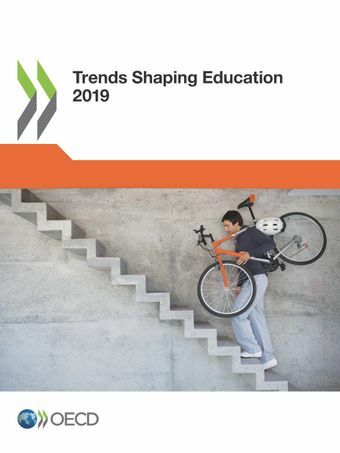 Or what the impact of climate change might be on our schools, families and communities?Trends Shaping Education examines major economic, political, social and technological trends affecting education. While the trends are robust, the questions raised in this book are suggestive, and aim to inform strategic thinking and stimulate reflection on the challenges facing education – and on how and whether education can influence these trends.This book covers a rich array of topics related to globalisation, democracy, security, ageing and modern cultures. The content for this 2019 edition has been updated and also expanded with a wide range of new indicators. Along with the trends and their relationship to education, the book includes a new section on future’s thinking inspired by foresight methodologies.This book is designed to give policy makers, researchers, educational leaders, administrators and teachers a robust, non specialist source of international comparative trends shaping education, whether in schools, universities or in programmes for older adults. It will also be of interest to students and the wider public, including parents. OECD says countries should use global mega-trends to prepare the future of education. This new OECD report explores how children see their future, and looks at those elements that, if properly understood and harnessed, could help them realise their dreams.